Is our current approach to teaching adequately preparing young people to thrive in the realities of today’s world? Most often, the quality of our schools is judged by the performance of students in the basic competency areas of literacy and numeracy. While these fundamentals are absolutely necessary, it’s also important to continuously evaluate how well we are preparing our students for their life outside of school – how to successfully navigate the complex economic, vocational, social, cultural and environmental challenges they will face in today’s working world. In the whitepaper “New Pedagogies for Deep Learning: Education PLUS,” authors Michael Fullan and Geoff Scott take a look at how our approaches to pedagogy must evolve to keep up with the rapid changes in our 21st century society, technologically and socially. Based on studies of successful early career graduates and leaders who have helped create more harmonious, productive and sustainable workplaces and societies, the authors describe Education PLUS as a set of “powerful new learning modes steeped in real world problem solving,” incorporating both the development of the fundamental competencies (skills and knowledge) that will help students cope in an uncertain, ever-shifting world and the personal, interpersonal and cognitive capabilities that will allow them to excel. Education PLUS is, therefore, not simply about learning 21st century skills in isolation from doing, nor is it about acquiring basic skills and knowledge out of context. Instead, it is about collaborative learning through reflection in action and on action in order to become better at negotiating the messy, fuzzy, dilemma‐ridden context of real‐world life and work with positive impact. It is about developing an attitude of mind, a set of values and the personal, interpersonal and cognitive capabilities identified repeatedly in studies of successful early career graduates and those leaders who have helped create more harmonious, productive and sustainable workplaces and societies. They describe two foundational concepts referring to the deep learning of 21st century skills. The first is Ethical Entrepreneurialism, which they refer to as E Squared. This new definition of entrepreneurialism carries a deeper meaning than just making money – it’s about being able to “identify and resolve complex personal and societal challenges locally and globally.” For the first time in history, they say, the mark of an educated person is not just a thinker, but a thinker-doer who both learns to do and does to learn. Along with this, they describe an “exquisite awareness of the ethics of life,” both on a small scale (how they treat others) and a large scale (ethics concerning humankind and building a sustainable future that safeguards the planet). In this larger E Squared context, people work both individually and collectively in a way that incorporates adaptation and fosters resilience. 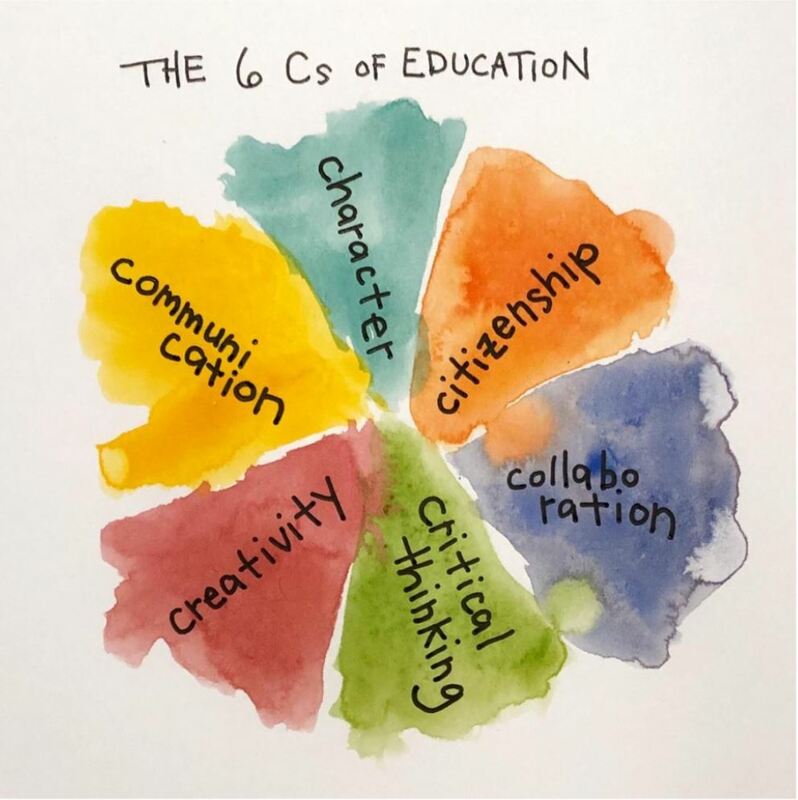 Another critical foundation is the Six Cs of Education. The major challenge for 21st century education at every level, they say, is “how to design itself so that it functions, day-in and day-out as an effective incubator of its chosen virtues” – the prosocial attitudes and epistemic qualities of the successful learner-doer. Taken together these personal, interpersonal and cognitive capabilities identify the underpinnings needed by school and college graduates if they are to build the communities, institutions and indeed the societies that will be socially, culturally, economically as well as environmentally sustainable over the coming years. And these value‐based capabilities are the engine‐house of ethical entrepreneurialism. • Gives focus to problem-based learning and assessment. In this scenario, the teacher is less of “the sage on the stage” or “a guide on the side,” and is more of a “proactive learning partner” – a broker between and among students, other teachers and high quality learning resources worldwide, using digital technologies to provide learning anytime and in any place. The authors say this approach helps combat the boredom – among both students and teachers – of traditional schooling and replaces it with learning environments based on four new criteria in combination. 1. Is irresistibly engaging and relevant. 2. Uses information that is elegantly easy and efficient to access. 3. Features the ubiquitous use of digital for (inter) active learning 24/7. 4. Is creative and change‐focused not passive and is steeped in real life (local and global) problem solving. The Six Cs are essentially interrelated. And so can be how they are incorporated in the classroom. For example, character and citizenship can be developed through the use of collaboration, communication, creativity and critical thinking. And these are all capabilities that can be supported with the Skooler learning management system. For teachers and administrators, educating with the Six Cs requires a somewhat different toolset and way of measuring progress. Skooler makes it easy to incorporate elements like formative assessments and project-based learning that support non-traditional approaches and help the teacher become the “proactive learning partner” in the classroom. For students, using digital collaboration and sharing tools like Microsoft Teams, OneNote and Sway, and presenting work with the Office tools used in the business world, like Word and PowerPoint, means students are developing important digital skills as they are developing the Six Cs. They’re learning a layered set of tools and capabilities that will continue to serve them throughout their education and beyond, helping them thrive in the complex world we live in today. How are you incorporating the Six Cs and E Squared in your teaching? Please share with us!